The scorecard is available for free. However, you must be logged in as an institutional member to access the interactive scorecard. Measure and improve the quality of your online programs. ¿Español? Acceda a La Tarjeta de Puntuación de OLC para la Administración de Programas Educativos en Línea. 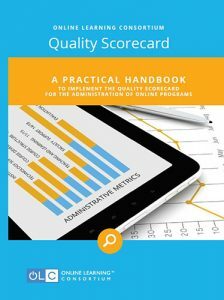 The OLC Quality Scorecard for the Administration of Online Programs provides benchmarks and standards to help you evaluate your online learning programs. By using the OLC Scorecard, an administrator – regardless of size or type of institution – can determine strengths and weaknesses of their program, and initiate planning efforts towards areas of improvement. The scorecard can also be used to demonstrate elements of quality within the program, as well as an overall level of quality, to higher education accrediting bodies. The Scorecard will give you the steps needed to identify, measure and quantify elements of quality within an online education program, providing the metrics to uncover and evaluate quality indicators in key categories, which include: Institutional Support, Technology Support. Course Development / Instructional Design, Course Structure, Teaching & Learning, Social and Student Engagement, Faculty Support, Student Support and Evaluations & Assessment. The Scorecard rubric is available exclusively to OLC Institutional Members. An Interactive Version is also available for our Institutional members. It serves as an online, collaborative dashboard and repository to assess, enhance and measure the effectiveness of your programs online. OLC Member? You may access the interactive scorecard here. Also available exclusively for institutional members is the Quality Scorecard for the Administrative of Online Education Programs and Regional Accreditor Standards Crosswalk. Download it here. You may purchase A Practical Handbook to Implement the Quality Scorecard for the Administration of Online Programs through our Publications page. The Interactive version of the Quality Scorecard is an exclusive OLC Institutional Membership benefit. Become a member today! Institutions can pursue a third-party, independent review through the OLC Quality Score Review Audit to benchmark against best practices as a continuous improvement resource. Those that achieve exemplary status may be eligible to display an OLC Exemplary Program logo on their website. Learn more.